For centuries, men and women have manned lighthouses to ensure the safe passage of ships. It is a lonely job, and a thankless one for the most part. Until something goes wrong. Until a ship is in distress. In the twenty-third century, this job has moved into outer space. A network of beacons allows ships to travel across the Milky Way at many times the speed of light. These beacons are built to be robust. They never break down. They never fail. 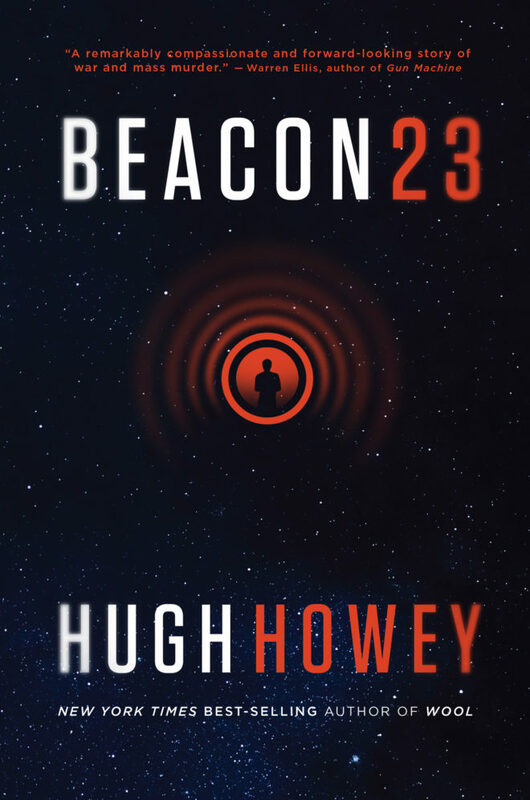 With Beacon 23, best-selling author Hugh Howey delivers white-knuckle suspense, with aliens, war, and madness all combining in a story of one man living aboard a beacon and his battle against the solitary blackness of space. Hugh Howey is the New York Times and USA Today bestselling author of Wool, Shift, Dust, and Sand. His works have been optioned for film and TV, with a feature film in development with Ridley Scott. His works have been translated into more than forty languages and have sold more than three million copies worldwide. Hugh lives aboard Wayfinder, a fifty-foot catamaran, on which he plans to sail around the world. A remarkably compassionate and forward-looking story of war and mass murder. Junk food, but not the kind you feel guilty about. A spectacularly told tale of one man’s experience with depression, guilt, love, and hope.